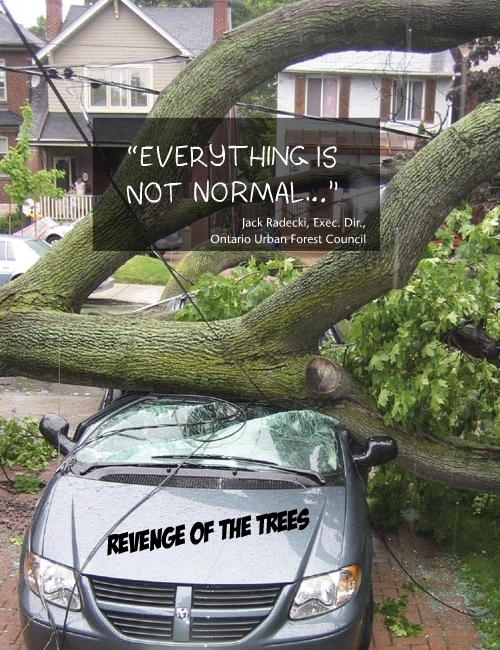 “Everything is not normal… The storms are for sure to do with global warming,” said Jack Radecki, executive director of the Ontario Urban Forest Council in a June 21/07 Toronto Star article. So I was glad to read yesterday’s article and see that Mr. Radecki was making the connection, and so were City of Toronto officials. The stats are that in the first 6 months of 2007, there have been 6,000 storm calls. That’s up from 4,000 in all of 2006. Before that, the annual average was 2,500 calls. Recently there has been speculation by some ‘Yale pundits’ that Canada might actually benefit from Global Warming… I have a hard time following that cynical logic for many reasons, including the fact that the increase in violent storms is destroying the lush tree canopy that Toronto has spent decades creating (not to mention damaging a few cars along the way…). I couldn’t agree more. Next week watch for an update on our battle to build an eco-friendly driveway. Asphalt and concrete are restricting water… that is so true, just down the street from where I live there was an entire tree that was uprooted from the storm. It literally pulled the square of dirt surrounded by driveway and sidewalk up, as if the tree was desperately trying to grasp something to keep it grounded during the storm. And also while observing the large number of trees that have crumbled because of the storm, I can’t help but notice the majority of damage is in the residential areas, while the parks (which can support more soil and water) just have a couple of branches down.